Ashdown House stands within the Parish of Ashbury and was built by the first Lord Craven in the seventeenth century; it is thought to have been used mainly as a hunting lodge. A distinctive staircase leads directly to the roof, where a viewing platform affords fine views across the Lambourn Downs. The grounds include an Iron Age hill fort which is thought to be the site of the ‘Battle of Ashdown’ (800 AD) where King Alfred the Great fought the Danes. 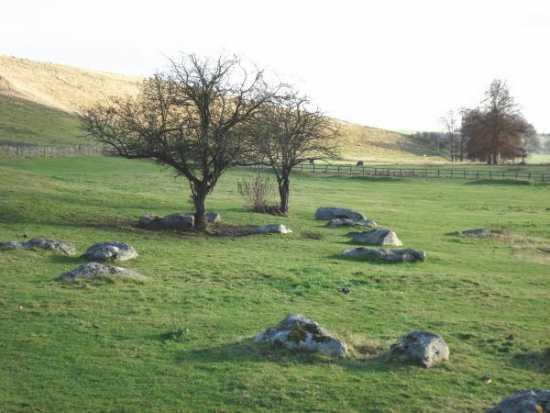 The valley near Ashdown House is peppered with Sarsen Stones (see photo below) which were used widely in ancient times for constructing megaliths. Ashdown House went through a major conservation project in 2013. A new exhibition was installed giving insight into Ashdown’s history, including the Craven family connection to Jane Austen. The house is open Wednesday and Saturday afternoons from 2pm to 5pm until the end of October. Buscot Park, near Coleshill in Oxfordshire, was built in the 1770s and is a fine example of the Italianate style. It boasts a delightful water garden, designed by Harold Peto, leading to the lake and also a Four Seasons Walled Garded created by the present Lord Faringdon who now lives in the house. The estate was bequeathed to the National Trust in 1956 and houses the Faringdon Collection of fine art and furniture. Cirencester (originally Corinium) was second only to London (Londinium) as the most important Roman city in the province of Britannia. Its market town status was mentioned in the Domesday Book of 1086 and regular markets are still held today. The town has many attractions, including the Corinium Museum, a Roman Amphitheatre, Cirencester Park and the Brewery Arts Centre which houses a gallery plus 10 resident craftworkers. Faringdon Folly Tower is 140ft high and sited half a mile East of the town on Folly Hill; it was opened in 1935 and is said to be the last major folly to be constructed in England. The tower affords excellent views across the Thames Valley and Berkshire Downs. On clear days it is possible to see five counties. Great Coxwell Tithe Barn was built in the 13th century and is a fine example of its type. It is 152 feet long, has Cotswold stone walls four feet thick, a stone tiled roof and still has its original timber structure. The Icknield Way is an lowland track thought to be less ancient than the Ridgeway (see below). It starts on the coast around Hunstanton and may be traced for 190 miles, passing by the villages of Compton Beauchamp, Ashbury, Bishopstone and Hinton Parva to Wanborough. It runs parallel to the Ridgeway in Oxfordshire. Kelmscott Manor in Lechlade is a grade I listed Tudor farmhouse built adjacent to the River Thames in 1570. It became the country home of William Morris, one of the leaders of the Arts and Crafts Movement born in the mid 19th century. Many of his creations and possessions may be seen in the house and he is buried in the churchyard. Lambourn lies in the Valley of the Racehorse and is a renowned racehorse training centre. It is also the location of seven barrows which lie over 30 earlier bronze age round barrows; one of these contained the cremated remains of 100 individuals dating from 2200 BC. The Merchant’s House, which is readily identifiable in the high street at Marlborough, was built in the 17th century for Thomas Bayly, a prosperous silk merchant, and contains fine examples of oak paneling and wall paintings. It is additionally used for art exhibitions, concerts and other events. Noah’s Ark Zoo Farm is a unique Zoo and working farm just 6 miles out from Bristol. It has become one of the South West’s top tourist attractions, welcoming 120,000 visitors per year and giving them a fun-filled, exciting hands-on experience in some of the most beautiful countryside in the region. It has won several Awards, including North Somerset’s Top Visitor Attraction. For the first time in over 1000 years the secrets of Oxford Castle have recently been unlocked revealing episodes of violence, executions, great escapes, betrayal and even romance. Walk through the ancient buildings and experience stories connecting real people to extraordinary events. The regeneration of this ancient building has attracted numerous awards. The Ridgeway is Britain’s oldest road – possibly more than 5000 years; it was once part of a prehistoric trail some 250 miles long, running between the Dorset and Norfolk coasts. Today, the Ridgway is a defined National Trail, spanning 87 miles. It starts near Avebury in Wiltshire and ends at Ivingho Beacon in Buckinghamshire and is linked to the East coast by the Icknield Way. The Ridgeway crosses the Parish of Ashbury at the top of Ashbury Hill. The Steam Museum of the Great Western Railway, at Swindon uses reconstructions and hands-on exhibits to recount the building of this famous railway and the golden age of steam. Tom Brown’s School Museum is sited in the schoolroom featured in the 1857 book “Tom Brown’s School Days” authored by Thomas Hughes who was born in the village. Sir John Betjeman, Poet Laureate, lived in the village as a newly wed and used to be a warden at St Mary’s Church. The Uffington White Horse overlooking the village is considered to be the oldest hill figure in Britain and one of the largest measuring 114 metres in length; it can only be seen in its entirety from the air. It is now thought to have been carved in the late Bronze Age (1000 – 800 BC). The area was once revered as a sacred place and the horse was long maintained by the process of scouring, an ancient ceremony last re-enacted in 2000. Dragon Hill lies below the White Horse and is said to be the site where St George, the patron saint of England, slew the dragon. Uffington Castle, an iron age hill fort, is situated at the top of White Horse Hill. There is a National Trust pay and display car park within a short walk of the hill figure and a smaller disabled parking area closer by. Wantage was the birthplace of King Alfred the Great in 849AD. His statue dominates the market place. The Vale and Downland Museum is an excellent centre from which to learn more about the heritage of the Vale of the White Horse, while Betjeman Millennium Park affords a pleasant walk along Letcombe Brook which passes the house once inhabited by the Poet Laureate John Betjeman. Six sculptures have been sited there incorporating extracts from Betjeman’s poems. Waylands Smithy, a megalithic chambered tomb built about 3400 BC, is sited on the Ridgeway about a mile from the White Horse. Inside the tomb there is an even older (3700 BC) earthen long barrow that covered a wooden mortuary house. 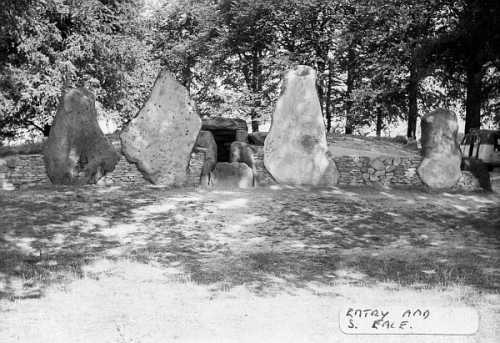 Wayland’s Smithy is associated with Wayland the Norse and Saxon god of blacksmithing. According to legend, a traveller whose horse had lost a shoe could leave the animal and a silver coin there overnight and next morning the horse would be re-shod. Westonbirt National Arboretum houses a unique collection of trees and shrubs which constitute a vital conservation resource. More than 350,000 people visit the arboretum each year to enjoy its serene beauty. The best times to visit are Spring for the expanses of wild flowers and Autumn for the stunning tree colours.